Boho style wall hangings have been popping up like crazy all over Pinterest, Etsy, and in so many of my favorite stores like West Elm and Anthropologie. I knew that I had to have one, but I just couldn't justify paying such high prices for something that I knew I could make. As always, the DIY option is so affordable and customizable! It's also incredibly simple. 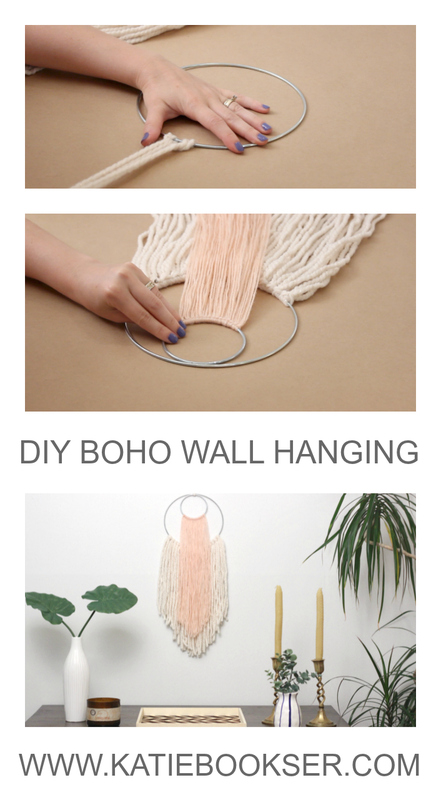 Choose any two colors of yarn that you want to use for your wall hanging. You can find these metal rings in the leather section of the craft store. You will need two different sizes. Take one color of yarn and wrap it around something that is about 1.5 feet long. I'm using this mat but you can also cut out a piece of cardboard to be the correct length. Continue wrapping it around multiple times. Cut across the yarn at the bottom. Repeat this same process with your second color of string. Grab 2 pieces of yarn and fold them in half so you have a loop at the top. Slide the loop under the ring and pull the ends through it. Pull it tightly against the ring. Continue this process using two pieces of yarn at a time until you have covered the bottom half of the ring. Repeat this same process on the smaller ring with your second color of yarn. Place the smaller ring inside the larger ring and center it. Cut an extra piece of yarn and tie the ends together in a double knot. Slide it under both rings and bring the knot end through, pulling it up and tightly against the ring. This will be used to hang it up. Cut each color of yarn into a V shape, starting in the middle at the bottom and working your way up to the outer edge. That's it! Who knew it could be so simple? Hang it up and admire your new decor piece. If you recreate this DIY be sure to tag me on Instagram for a chance to be featured. Check out my video below for a full tutorial! Don't forget to PIN the image below to save this idea for later!